McDonald's Fries and Portion Size: What Size Is Your Treat? At a recent trip to McDonald's, I found the cutest thing. Check out that little fries container above on the right- adorable and reasonable. For those who are wondering that tape measure is in INCHES - sorry international peeps - my readership is 90% in the U.S. and yes, we are wondering why we aren't on the metric system. The wee little box is for the fries that they put in the "Happy Meal" with the apple slices. They have done away with the sugar dipping sauce for the apple slices and now you get fries AND apples. You know what? I don't have a problem with this serving or having this as a treat. The sad thing is that McDonald's won't sell you this size without buying a Happy Meal! Ahem...yes, you could feed a small country with the LARGE fry. 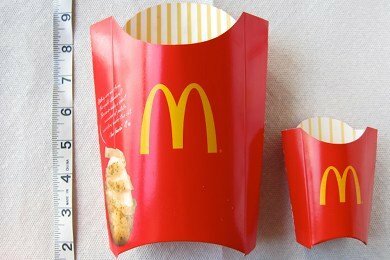 Anyone else remember when you could "Super Size" the large fries? Yikes! If you bought the large fries and shared them between 4 people, you would be doing great! But, who does that? 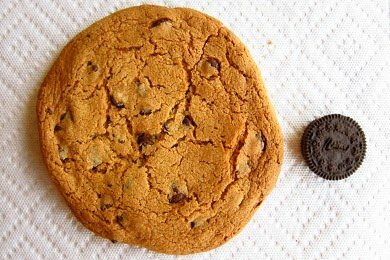 Why do we need a cookie that large with our coffee? See my post on this cookie here: Check Out This Cookie (Scary). It is ridiculously difficult to go out and buy a reasonable portion size. Candy has a KING size for almost the same price as the small size, chips are 99 cents a bag for 500 calories, and soft drinks are always over 20 ounces. I think treats are great and an important part of life - but is almost impossible to have a junk food treat without derailing your healthy eating plans. Most of the food I am talking about is snack food that we buy on the run. We are all unconsciously inhaling way too many calories of garbage and not enough calories of the good stuff. Toss out half the fries or share them with a friend. Pack your snack to avoid having to buy one. Make sure you aren't famished at those "weak" times of day. And realize that the FORCE is not with you - you have to actively choose NOT to eat most of what is offered to you when you are sprinting from place to place. How Do YOU Control Portion Size? I always carry a snack ... Usually a Larabar or something else that will last a while. I would eat the tiny fries occasionally but I never order fries because I can never eat just a few! We rarely stop at McDonalds, but the other day my son wanted to go after a doctor's appointment, so I gave in. The fries always smell so good, but I tried a few and they really weren't. Kind of lukewarm & salty, but not nearly as good as they smelled! I agree - pack a snack or treat yourself on something you really enjoy! French fries are my No.1 weakness! Especially those from McD's or Wendy's. Yum. I rarely eat fast food but when I do, I try to get the smallest fries possible. And I always say the same thing about portion size on everything nowadays! What is with the king size cookies and chocolate bars? Sometimes, I just want a bite of something with my coffee. I guess that's just not doable anymore. I love this line, "And realize that the FORCE is not with you - you have to actively choose NOT to eat most of what is offered to you when you are sprinting from place to place." That is the truth! There is another option. Eat snacks with natural ingredients. Great all-natural substitutes are available for just about any junk food snack - from chips to cookies. A little more expensive, yes. And no, I would not characterize them as 'healthy'. But definitely a better snack choice when you just want to satisfy that sweet or salty craving. I've never eaten the fries since watching the DVD extras on Supersize Me. They looked fresh 10 weeks on - don't think I want those in my body thanks! And we do use inches in the UK, despite being a metric country. I use both when I run classes and workshops, depending on who I speak to. But we do measure weight in stones and pounds, rather than just pounds! I'm curious... how is that small container of fries 230 calories and 5 grams of fat, whereas the large one is a little over double the amount of calories (230 vs 500), but FIVE times the amount of fat? wouldn't the fat count be a little over double as well? I haven't eaten at McDonalds in a long time. I remember when they used to have paper bags for the Happy Meal fries. When Superside Me came out, McDonalds changed Supersize to Large and completely got rid of the large size. I thought it was crazy that they didn't just get rid of the Supersize. If you haven't been to McDonalds lately, you need to go and try their oatmeal for breakfast. Yummy with fresh fruit (approx 300 calories) and very filling. I saw someone posted a photo of the new little mini happy meal fry box on facebook and it got nothing but negative comments about how angry they were because their kids only got a few fries. Sad. I don't eat at McD's, but I was happy they did it! Plus, the box is pretty cute. I love the new mini fries. Used to, I'd order one of my kids the fries, the other would be apples, and I'd split them both with my 2 kids, and I would nab one or two fries to eat with my wrap or salad or whatever I was in the mood for that day. Pretty good strategy. With this new meal, both my kids get about the same fry portion and a WHOLE package of apples which I like even better. Mom still gets a fry or two, too. He he. But, I also discovered that the big kid meals only come with fries and no apples, so watch out for that if you're expecting apples and fries, you'll be disappointed. Now if they'd offer a grilled chicken wrap in the happy meals instead of just burgers or nuggets, I'd be an even happier mom! My kids love the wraps and I do, too. They're a great snack or lunch for me, paired with apples, or an apple walnut snack tray or one of those cute little yogurt parfaits and a 99¢ large tea... pretty good for fast food. McD's isn't the best, but with a playground and some pretty fun toys, it's a good treat every once in a while for my kids when I've tortured them with a day of grocery stores and errands. I am an adult who has chosen Happy Meals for my occasional trips to McDonalds. I like have the hamburger and fries but regular size meals are too much to eat at one time. Now with the smaller fry and the apple slices I enjoy it even more. How do they even measure the sodium content of fries? I've had fries that have been light on the salt and some that have been DOUSED in salt. The serving sizes of things these days is absolutely insane. No wonder were such an obese country. I'm from Australia and I had McDonalds for dinner tonight. My medium sized fry container is still around, so I measured it. It's about the same size as the smaller container in your photo. Is that big one a family sized portion? I don't think you should tell your readers to toss out fries. I don't think spending the money just to be wasteful is a good idea. People should have enough self control to either buy smaller fries or no fries at all. Kind of perplexed to why you would promote something so distasteful. Are your eyes closed to the hungry around you?